A busy executive with a young family, the owner of Trinity Yachts’ new 36.7 metre superyacht Finish Line knew exactly what he wanted out of his next yacht. He enjoys quick trips from Florida to The Bahamas. His yacht needed to get off the dock fast and run with minimal crew. Specifically, it needed to make at least 23 knots and have a draught under six-and-a-half feet. It had to look sporty, but be more substantial than an express to accommodate his family’s needs. When the economy took a downturn several years ago, he turned to his longtime captain, Billy Lockhart, to see if there were any steals on the market. ‘But after you’ve stolen the thing, the question becomes, do we really want it?’ says Lockhart. Any necessary modifications to the yachts they looked at proved to negate any savings. Trinity Yachts, which later accepted the project, had a hull close to the desired size, but it was not designed to go the owner’s specified speed. There didn’t appear to be any semi-custom options on the market that suited this owner’s needs. ‘The initial inquiry was at one hundred-sixteen feet and we did not have an existing design that would work,’ says Billy Smith, vice president of Trinity. 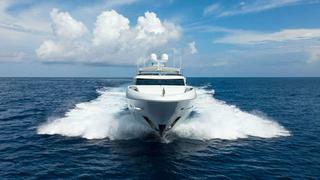 But the yard did have an ABS-classed 124-foot hull that offered some promise. ‘We knew we could create a new [120-foot] hull based on our existing one hundred twenty-four-foot hull design to meet their requirements,’ says Smith. The first hurdle was the draught. Lockhart would settle for six-and-a-half feet but ideally wanted five and a half, a draught that opens up the most cruising grounds in The Bahamas. Trinity’s engineering department modified the chine/spray rails forward for more speed and incorporated newly designed propeller tunnels that had been tank tested and proven successful on two of the yard’s larger and faster hulls. These larger tunnels would accommodate the five-inch shafts, and 53-inch six-bladed props for MTU’s new 16V 2000 M94s, bringing the wheels higher into the hull, which reduced the draught to a shallow five feet, six inches. The MTUs, with 2,600 horsepower at 2,450 rpm, also gave them the power and speed they were after, in the end exceeding the contracted speed by half a knot. 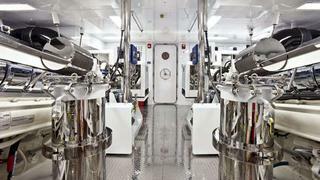 Mechanically, the captain says, Finish Line has a 160-footer’s worth of machinery and systems packed into a 120-foot boat, yet in a clean, uncluttered engine room, leaving everything accessible. This owner took it a step further. ‘Everything in here has either been taken from manufacturer, disassembled, sent to the chrome platers, reassembled and installed on the yacht, or is made of mirror-polish stainless steel… everything is jewellery-ed up,’ says Lockhart. The wow factor the owner desired in the mechanical space is carried over to the guest areas. 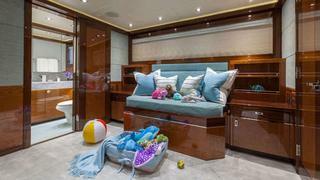 Joanne Lockhart of Fort Lauderdale-based Yacht Next designed an interior that not only delivers a platform for very high-end service, but also provides a relaxed family atmosphere. The guest quarters had to accommodate the owner’s young children and cater to adults. How Joanne Lockhart achieved this within 120 feet is a feat of ingenuity. 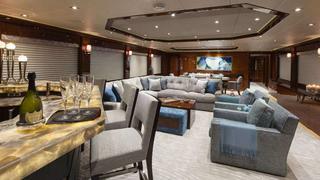 The master is aft and full beam; forward are three guest rooms, which could be configured as three queens or as a queen, a twin and a playroom. The queen/playroom conversion on Finish Line is particularly unique. One piece of the three-piece mattress comes out and can be stowed in a capacious nook behind the lower-deck stairs. The other two pieces are hinged and fold in half to transform into a couch. The closet even has removable shelves to accommodate toys. Another wow feature of the lower deck is the master closet. The original layout had his and hers baths, which the owner’s wife did not care for, while the owner requested a closet that ‘looked like the menswear department of Barneys in New York City.’ Switching up the closet and bath space created a closet that runs the full length of the 25-foot beam. A hidden pocket door closes off half the space if friends are using the yacht or if it enters charter service in the future. The en suite is still a generous size, offering a spa-like ambiance. 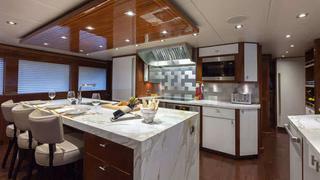 Also critical to the owner’s brief was a North American-style country kitchen, the heart of the yacht, according to the captain. It’s both a casual hangout and breakfast spot for guests and a stunning showpiece galley for the chef, who hails from Donald Trump’s Mar-a-Lago Club in Palm Beach. The top deck of Finish Line has a clubby Miami feel. There’s no Jacuzzi or dining table, just a glass-tiled bar and fabulous lounging space on ultra-comfortable settees. The flybridge is well shaded with canopies extending from the hard top. To make superyacht cruising more comfortable in the islands, oversized air handlers blow cold air on the aft deck through six adjustable nozzles in the overhead, so someone at the bar, for instance, can enjoy an al fresco drink comfortably in the still and humid Bahamian summer. Three more nozzles blow air at the feet of those in the bench settee. 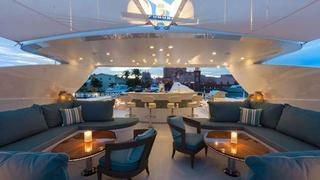 It’s just one of the modifications that has made this yacht ideal for the owner’s program. Perhaps the name Finish Line alludes to the end of a project that began as a simple brokerage search and segued into a near-custom build delivering all the owner’s wishes. If so, it’s a clear victory.